Use SMS and MMS messaging. Short Message Service (SMS) and Multimedia Messaging Service (MMS) are types of messages delivered directly to a mobile phone that can be used with or without mobile app downloads. 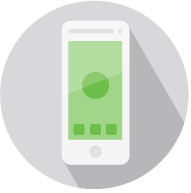 Text messaging via SMS or MMS is a quick and efficient way to grab your audience’s attention. MMS (multimedia) messages go a step further to include text, photos, videos, audio, or images. Establish a mobile app strategy. Mobile apps can help extend your product, drive engagement, or support commerce. Start by creating a cross-functional team to develop app goals and a roadmap. Goals might include acquisition, engagement, or even conversion. Next establish testing using control groups that can evaluate the programs and tactics to determine if a particular CTA had an impact. compares two elements such as landing pages, app home screens, or CTAs by splitting the traffic between both and comparing results. This is effective for testing variables such as headlines or CTA button colors. compares a much larger number of variables. You can compare a combination of multiple designs, CTAs, imagery, and copy choices-but you need high traffic to do it right.